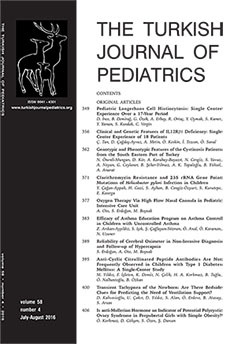 6 Dermatology Clinic, Dr Behçet Uz Children’s Hospital, İzmir DOI : 10.24953/turkjped.2016.04.001 This study aimed to analyze children with the diagnosis of Langerhans cell histiocytosis (LCH) who were diagnosed and treated between 1998–2015. Medical records were evaluated retrospectively for clinical and laboratory features, treatment details, and outcome. There were 20 patients, the median age of diagnosis was 37 months, M/F ratio: 1.5. Nine had single system (SS), 11 had multisystem (MS) LCH. Spontaneous regression occurred in three infants with skin limited LCH. Eight patients had risk organ involvement in MS-LCH group. The curettage alone was performed in only one case. Patients received LCH-II/ LCH-III based chemotherapy schema. Radiotherapy was performed to vertebral disease and residual craniofacial bone disease in four cases. The regression and relapse rates were 100% and 33% for SS-LCH. The regression and relapse rates were 73%, and 18% for MS-LCH. Two infants with MS-LCH died despite chemotherapy.